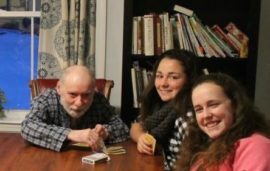 Two or three times a year, groups of college students stay a week at L’Arche Boston North, learning lessons the classroom cannot give, experiencing what words cannot adequately describe. The students help out—in the office and around the house where they are staying—but by the end of the week, they learn that they were here not to help but to be inspired, not to teach but to learn. Together, they return to their campuses and communities and spread the word of L’Arche. At Assisi House, Michael and Jimmy collaborated on this poster for our visitors from Stonehill College. 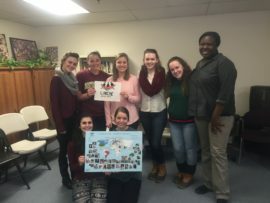 Seven undergraduate women from Stonehill lived in community with us for five days in January. They came representing Stonehill’s HOPE Service Immersion Program. HOPE is an acronym for Honoring our neighbor, Organizing for justice, Practicing peace, Encountering God. The Stonehill College students offered a powerful presentation to a meeting of assistants on their last day. 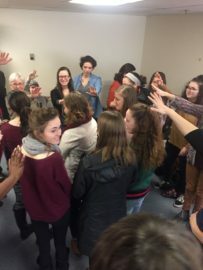 They came up with a list of words “that come to mind when we hear the word L’Arche.” The list included genuine, compassion, mindful, love, joy, listening, friendship, hope, prayer, community, beautiful, belonging, welcoming, respect, and solidarity. Assistants offer a blessing for our visitors from Stonehill College after their presentation on their last day in community. One student noted that some of them “struggled with free time,” thinking that they didn’t have enough to do. But there was a lesson here. Vanessa Henry, L’Arche Boston North’s community coordinator, coordinates the college program. With her team, she reaches out and invites groups, then orients and guides them during their week in community. Vanessa Henry, right, with the students from Stonehill College. Back row, from left: Sam MacFarlane, Julia Adams, Michaela Brown, Mackenzie Mayes, and Emily Rowland. Front row: Allison Faraclas and Karyn Cotter. Reflecting on her own experience as an assistant, Vanessa noted how perceptive the Stonehill students were, immediately recognizing both the challenges and the rewards of life at L’Arche. Vanessa has seen many fruits of our college outreach program. One of these is Todd, a longtime L’Arche Boston North assistant and a graduate of Holy Cross. Todd did not take part in a student week at L’Arche Boston North, but a Holy Cross friend did so and told him about it. 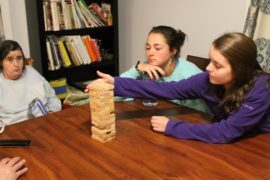 At Pat House, Fran plays Jenga with Stonehill College students Julia Adams and Karyn Cotter. We hope that the Stonehill women will visit us again too. Who knows? Perhaps one of them will be an assistant with us in years to come—or tell a friend about L’Arche. Viewing L’Arche from a social-justice perspective, Stonehill senior Allison Faraclas summed things up well, saying, “I love what you have here at L’Arche and I would hope some day that there would not be a need for this, that it would just happen, would come together.